Last year I set myself a challenge to use 5 fabrics from my stash that I was nervous about using for one reason or another. The intention was that any of those fabrics that I didn’t use would end up on the log burner at the end of the year if they weren’t touched. Well, to summarise, last year I only cut in to four out of the five fabrics. I have however, not thrown the last fabric on to the fire, because I have good reason for not cutting in to it. Over the past six months I have lost quite a lot of weight, and after losing that weight my shape has still to stabilise. I have decided on the pattern for this piece of fabric, but I don’t want to make a dress that is unlikely to fit me a month after I have made it, just so that I can complete the challenge. As such, this one piece of fabric has been added to my Use 5 list for 2018. The monochrome floral border print that I didn’t cut into in 2017 has to be in my list of fabrics for 2018. 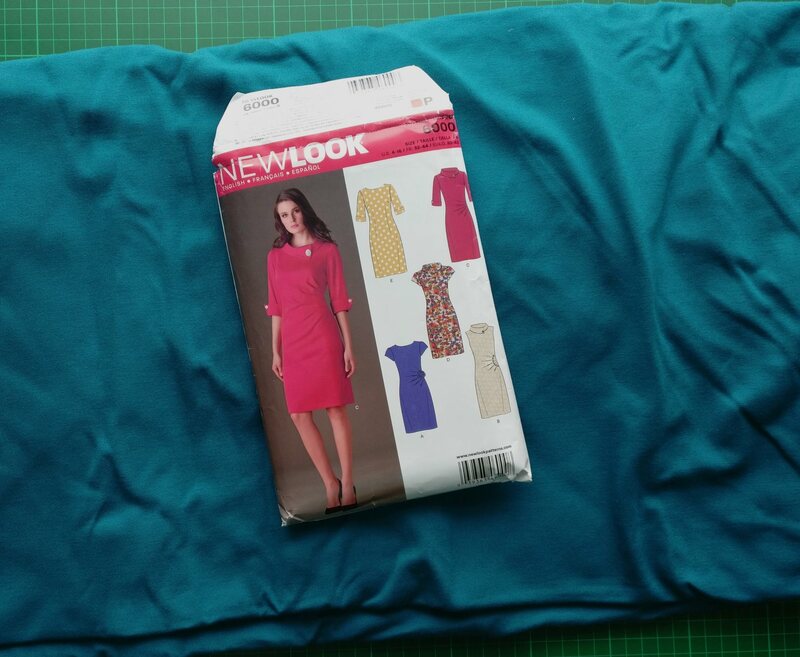 I think I have decided on the shift dress pattern in the GBSB Sew Your Own Wardrobe book, but I am also considering Simplicity 8258 (an Amazing Fit pattern) or Simplicity 1913 (another princess seamed bodice but with a possibility for a flared skirt). I’m not sure what shape skirt to go for, but I know that straight skirts tend to look better on me, so that’s probably the way I’ll go. I really want a waist seam, as I have plans for the pattern rising up from the hem and down from the shoulder. That said, I know I will have to do an FBA and I think it’s probably easier to adjust a pattern to include a waist seam than to do the FBA! About 10 years ago I had a black faux fur jacket that was fabulous – it was RTW and to be honest, I’ve been looking for something similar ever since. 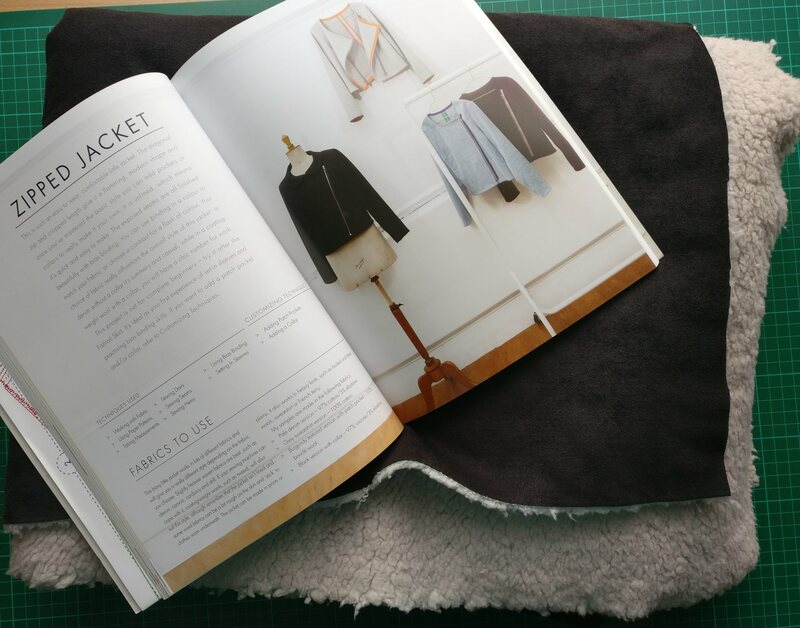 Well, upon winning the Wendy Ward book I decided to stop looking for the jacket and start looking for some fabric. Back in about February 2017 I came across this faux shearling in Fabric Land and ended up carrying home a rather large bag of fabric. I decided to use this fabric as the jacket pattern is unlined, and both the right and wrong side of this fabric are lovely. My real fear factor here is that I’ve never made a coat before (although as an unlined jacket, I’m not sure how this will be more difficult than say a shirt in a normal fabric) and I’ve never tackled such a thick fluffy fabric as this. What I am really confused and concerned about is attaching interfacing…do I shave the fluffy side, and attach it to the wrong side of the suede side? Do I attach it to the suede side? what on earth do I do?! I have 2m of this metallic, described in the advert as chainmail fabric. 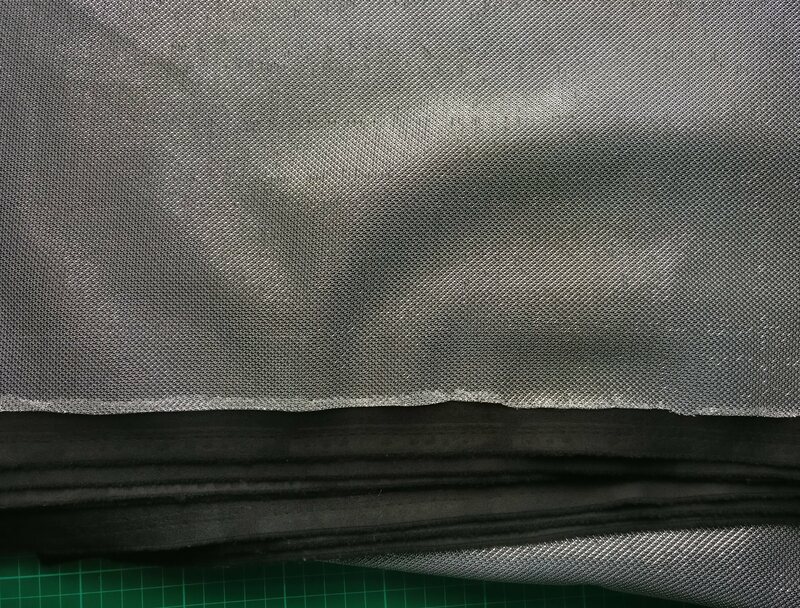 It’s a black stretch fabric, overlaid with a metallic woven layer. I have absolutely no idea what to make with this. I think it has to be a dress or skirt and top set, but I’m not really sure what pattern to use. I am considering New Look 6209, as I think I could have the centre front and back panels in the metallic, with plain stretch black material for the side panels. This is up for consideration as I don’t really do sparkles or metallics – I think I’ve owned 1 garment with sequins in the past 25 years, and that was only worn once or twice. As for why this fabric is scary? It’s a stretch fabric with a metallic overlay – honestly, what more do you want?! Jeans…I live my life in them, but I’ve never made them, and never sewn with denim. I have also never made a proper pair of fitted trousers. All in all, this little lot scares me, and if I don’t get on and use it, it’s going to taunt me forever. 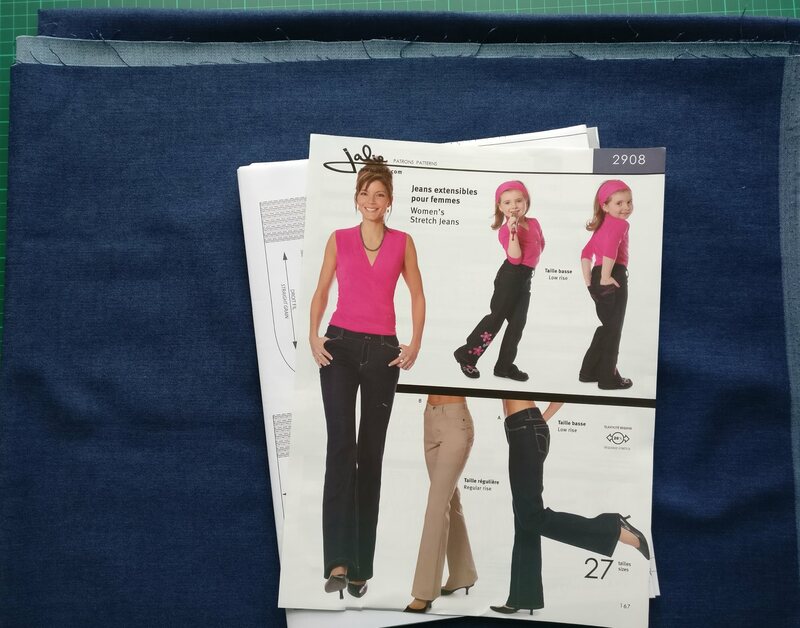 It’s a lovely stretch denim bought for me by my family this Christmas, I can’t wait to try the pattern and the fabric, but equally, it terrifies me – a perfect candidate for my Use 5 list. Last but not least is this gorgeous teal / peacock blue ponte di roma fabric bought from Abakhans, that’s destined to become a version of New Look 6000. Again I will need to do an FBA, and I’m not entirely sure how to do that in an assymetric pattern piece. 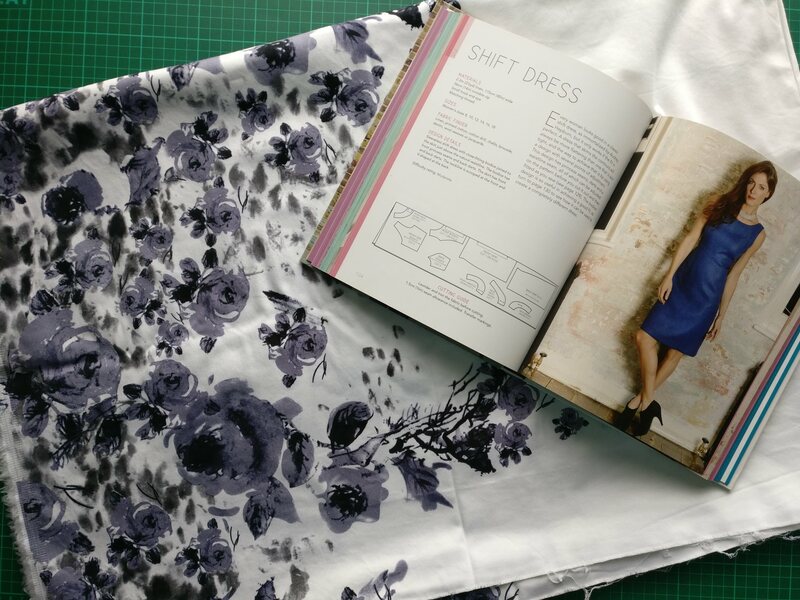 I’m also not sure about adjusting a pattern designed for a woven fabric for a stretch fabric, and I’m really keen for this dress to come out “right”, so I’m adding considerable pressure to myself. So there you have it, 5 fabrics in my stash that I am anxious about using. 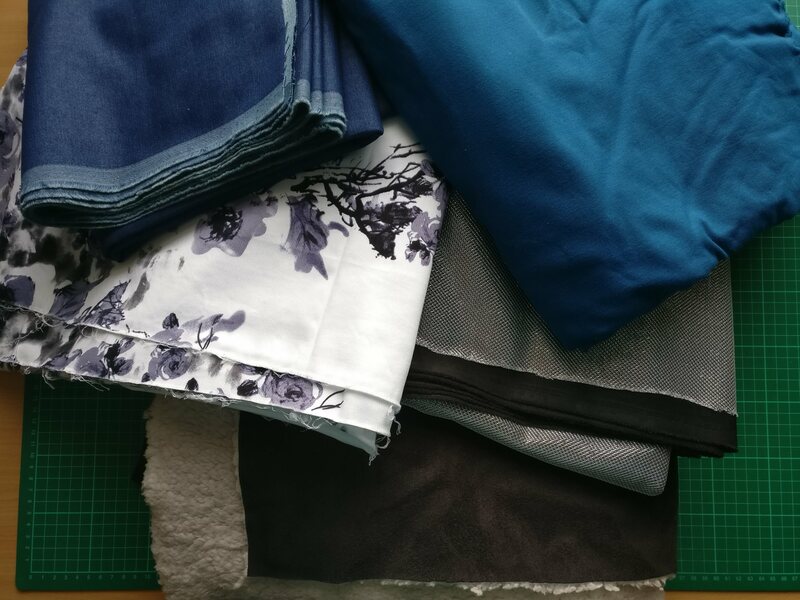 I will obviously sew other items throughout the year, but I will make something with each of these 5 fabrics, else they’ll end up on the fire. Scary as that sounds, it actually takes some of the pressure away, as I don’t have the luxury / temptation / fallacy / excuse of waiting until I’m able to make the perfect garment. Does anyone else have any fabrics in their stash that they’re too afraid to cut into? I hope so, I really hope it’s not just me!